Used Audi A4 Review - 2008-2015 | What Car? This Audi A4 was designed to beat the BMW 3 Series and Mercedes C-Class, but fell just short. Then again, it retains Audi's restrained styling, so if you're looking for understated elegance, this could be the car for you. The handling is balanced, and there's plenty of grip through bends. The steering can feel rubbery, but it provides reasonable feedback. 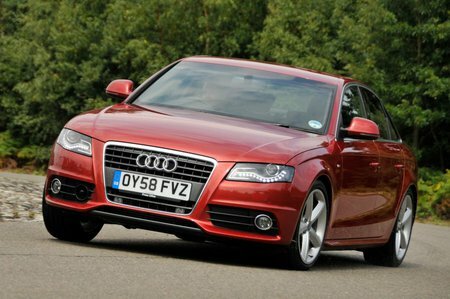 However, the ride is on the firm side and the A4 doesn't cope with bumps very well. Watch out for the off-set pedals in manual models. The cabin is well laid out and spacious enough for four adults. Visibility is good, and the driver's seat is easily adjusted. The boot is bigger than both the 3 Series and the C-Class's. The A4 is no longer the class leader in terms of fit and finish, but the interior is generally good, built with quality materials that have a solid feel.